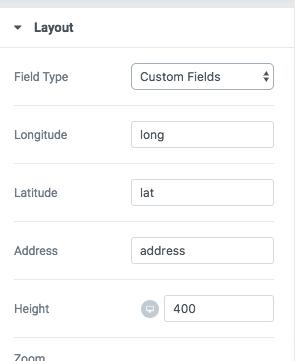 Custom Field Map widget allows you to show Google Map from data saved in your custom field. It can be used in two modes. 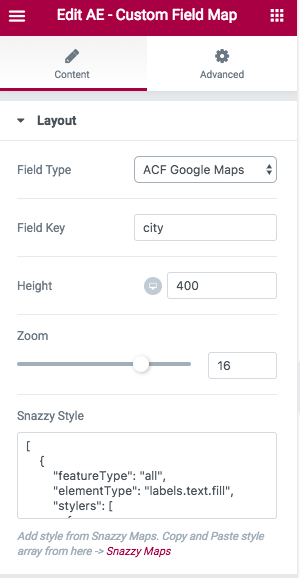 In ACF create a field with Field Type as Google Map. Now in widget do the following configuration. Snazzy Style: You can apply styles from Snazzy Maps and give your maps a different touch. This is an optional field. If you leave it then it will just display your map in default Google Map theme. There is another method to show Google Maps using custom field data. Now in widget do following settings. Address: Key of custom field created to save Address data. All other settings are same as defined above.